Who in the United States doesn't remember our first manned lunar landing??? What a thrill it was to see the first human beings walk on another planetary body! I felt such pride that it was my country that accomplished the feat. I've been an avid fan of space travel since the first attempts to leave the earth's atmosphere began. There have been many other manned space flights since the first lunar landing and each mission is a vicarious thrill to me. We've been to Houston twice for races at nearby Huntsville State Park but never had the opportunity to visit the Johnson Space Center until this trip. This morning we drove about thirty miles from Galveston north on 1-45 to Space Center Houston, arriving just before it opened at 10 AM. The timing was good, allowing us to see everything we wanted before the place closed at 5 PM. 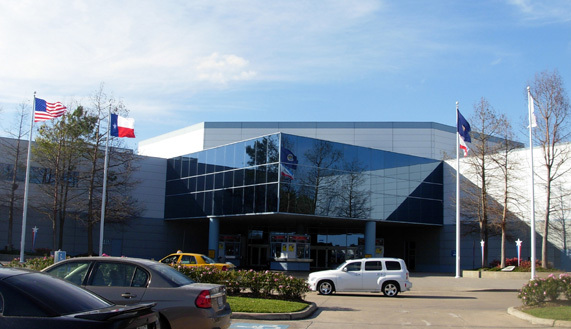 Space Center Houston is the official visitors' center of NASA's Johnson Space Center. You can drive right up to the door of the visitors' center, but you can't just drive into the actual NASA Center unless you're one of its 14,000 employees or on official business. 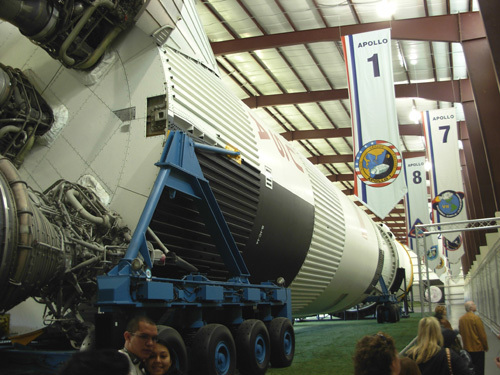 Once you buy a ticket at Space Center Houston, you can enter the 1,600-acre NASA complex -- but only on an escorted tram tour. 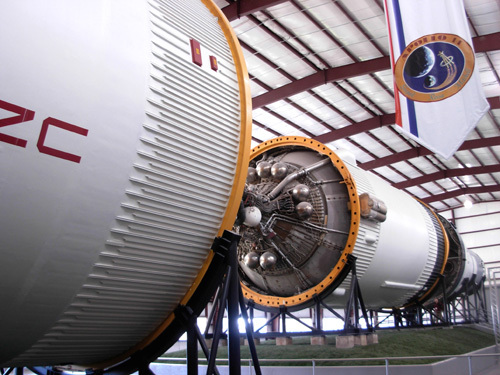 Space Center Houston is a non-profit organization owned and operated by the Manned Space Flight Education Foundation, Inc. Its purpose is to educate the public about space flight programs in an entertaining sort of way, and it does a fine job with that "mission." It's a hands-on science museum on steroids. Activities inside the visitors' center are self-guided so you can spend as much time in each area as desired. All the exhibits, simulators, and activities are as realistic and life-sized as possible -- and just as much fun for Big Kids like us as for Little Kids! On this February weekday the visitors' center wasn't very crowded but it takes planning to see all the attractions in one day. Each is scheduled at certain times; it almost requires a spreadsheet to fit everything in, or not miss something you really want to see. You have to set priorities. We were fortunate not to have to stand in line for anything and there weren't very many school-age kids around. I wouldn't want to visit on the weekend or other seasons when it's busier. 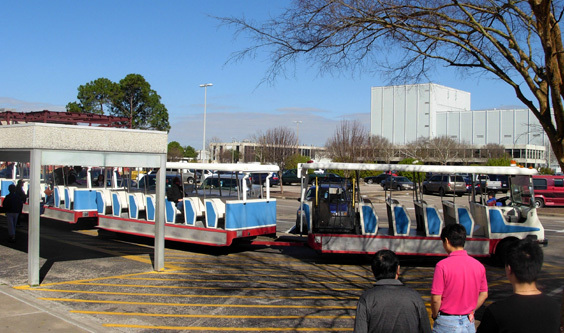 The tram tour over to NASA is also more pleasant during cooler seasons. Weather isn't a factor if you're just doing the activities inside the air-conditioned visitors' center. Once on board, we relaxed and enjoyed the 90-minute ride from one interesting presentation to the next. Johnson Space Center is a federal (National Aeronautics and Space Administration) facility. It's a busy place. 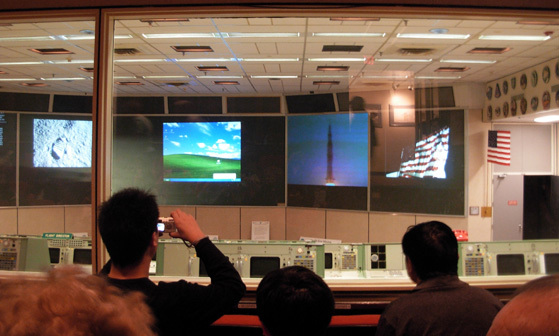 Our country's space shuttle program is managed here and the astronauts are trained here. 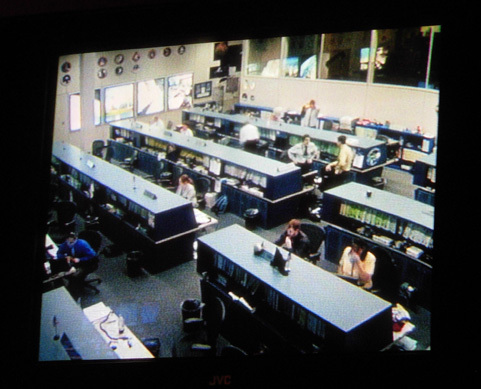 JSC is the control center for the shuttle missions even though the shuttle itself usually launches and lands in Florida. 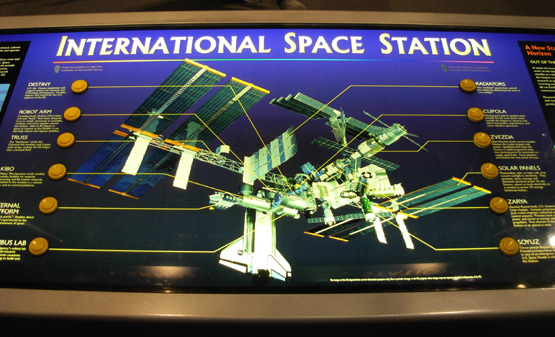 It is also the lead center in design and implementation of the International Space Station (ISS). Here scientists and engineers study human adaptation to space and develop the technologies that allow us to go to the moon, Mars, and beyond. 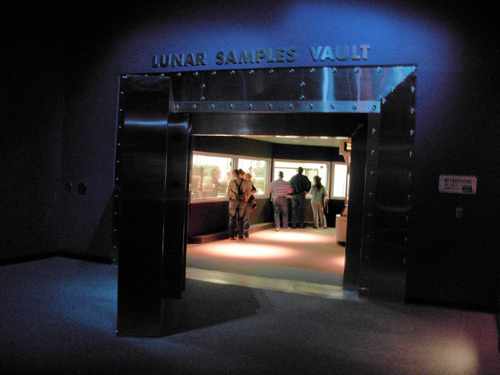 The Center also houses rocks and soil collected from the moon and Mars missions; some are also kept in a vault at the visitors' center. Our first stop was at Mission Control, where we sat in an amphitheatre above the control room used for flights (mostly the Apollo Program) during the 1960s and '70s and listened to a live presentation by one of the retired astronauts about those missions. We got to watch real astronauts work with a real replica of that robotic arm (above) at our next stop! 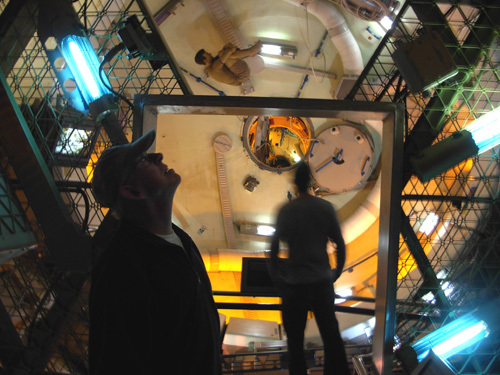 Jim and I were fascinated with our tour of the huge building where the astronauts train on life-size mock-ups of the equipment they will be using in space. The sign above shows the layout of the training center. 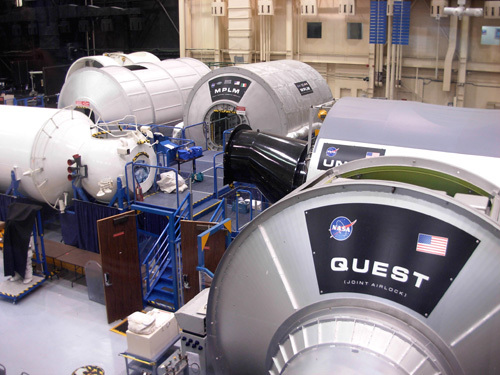 Space station training equipment is to the right, shuttle trainers in the middle, and robotic trainers to the left. First I'll show you some of the space station training equipment, exact replicas of the components that are already in place or soon heading to the ISS. The next photo shows a Quest joint airlock, which is a pressurized unit that was installed on the ISS in 2001 to facilitate space walks. Very handy piece of equipment to have up there! You can read all about it here. 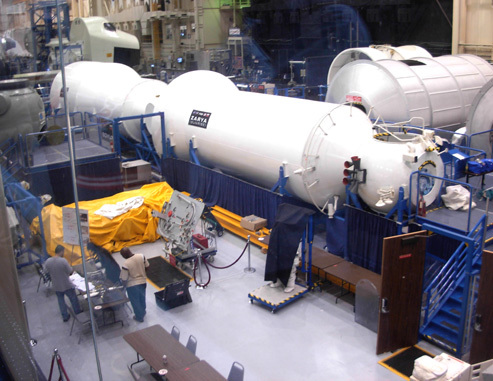 The long cylindrical Zarya Module shown below was the first component launched for the ISS. It provided the initial propulsion and power. 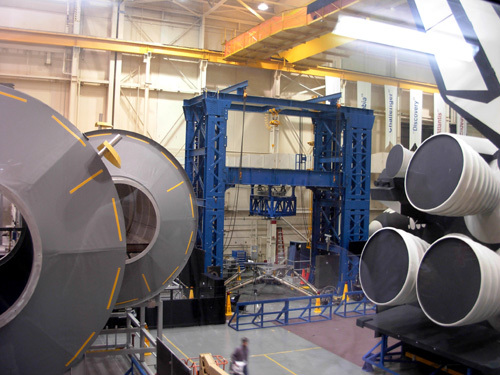 The module was funded by the U.S. but built and launched by Russia. Zarya means "sunrise" in English. Who says we can't all just get along?? I'm impressed with all the cooperation between the countries involved with the space station. 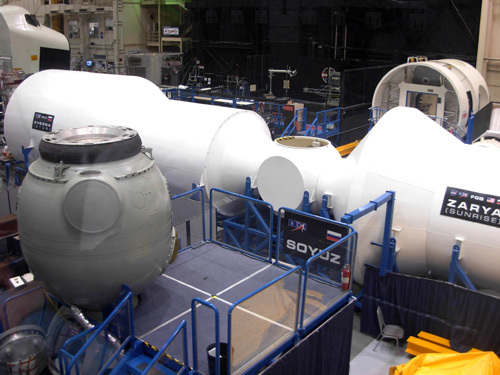 Replicas of two important U.S. space station modules named Destiny and Harmony are shown below. 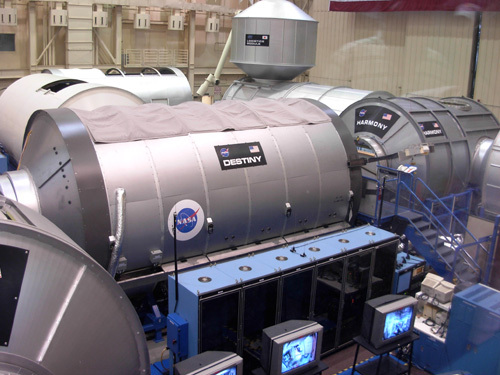 Destiny, delivered by shuttle in 2001, is the "guts" of research, command, and control of the ISS, including control of the robotic arm upon its arrival this spring. 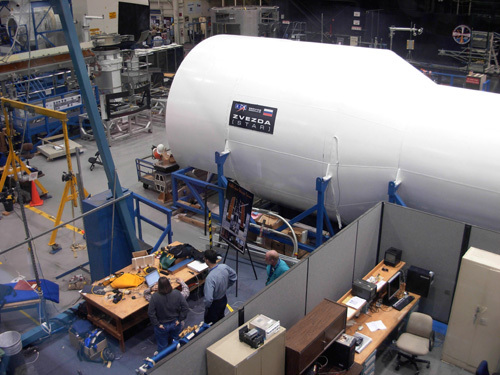 This laboratory module supports a wide range of experiments and studies that are intended to improve the life of folks on earth as well as facilitate future missions to the moon, Mars, etc.
" Harmony" is the very appropriate winning name for the second module, chosen during a contest for school kids. 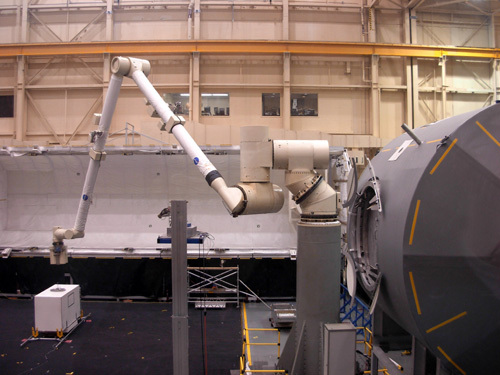 This pressurized module will be the connecting point between the U.S. Destiny lab, the European Space Agency's Columbus module, and the Japanese Kibo module. (Get it? "Harmony" exemplifies the cooperation by all the space station partners.) 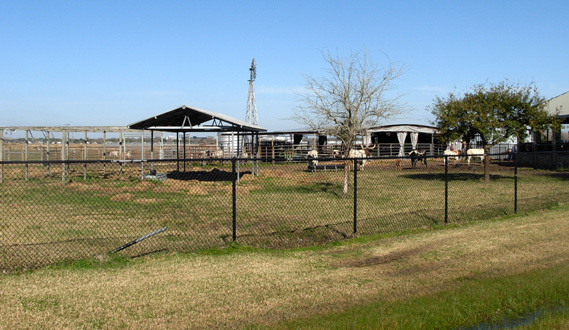 Columbus and Kibo ("hope") are additional research laboratories. Now here's a blast from the past: Soyuz. I saw that sign and wondered why the astronauts would be working with such "old" Russian equipment. Turns out the Soyuz program, which began in 1966, is still churning out spacecraft! Russia just doesn't rename its programs every few years like we do. A Soyuz space capsule took the first crew to the International Space Station in November, 2000. Since that time, at least one Soyuz has always been at the Station, generally to serve as a lifeboat should the crew have to return to Earth unexpectedly. The intelligence of that decision was underscored by the Columbia shuttle accident in 2003. Zvezda was one of the first components of the space station. It's a fairly self-contained module providing living quarters, life support system, electrical power distribution, data processing system, flight control system, and propulsion system. 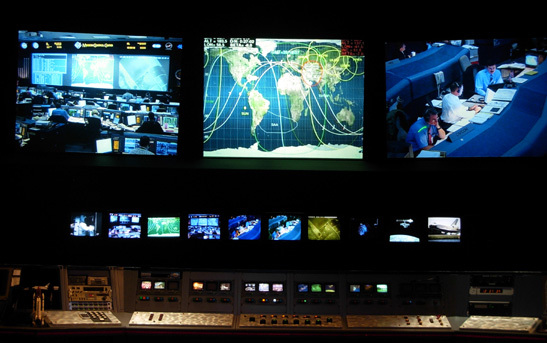 It also provides a communications system that includes remote command capabilities from ground flight controllers. 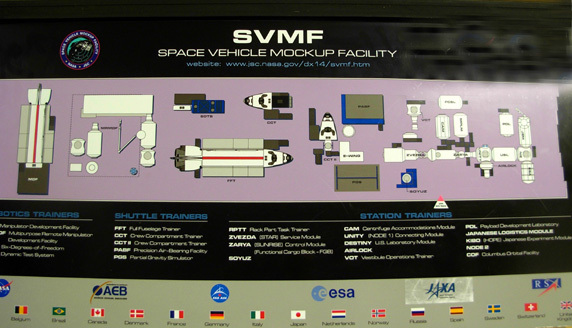 Although many of these systems are being supplemented or replaced by other countries' components, the Service Module will always remain the structural and functional center of the Russian segment of the International Space Station. When it is complete, the space station will house seven crew members and will have five laboratories for conducting various types of research in micro gravity. There are several more pieces that will be going up. 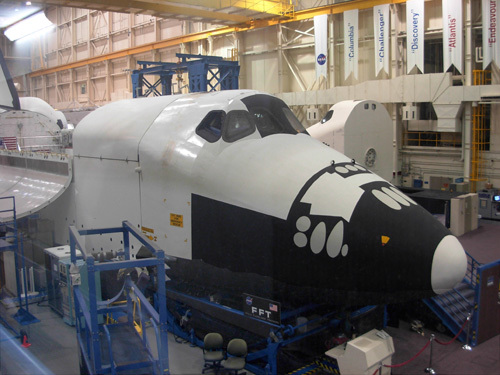 From NASA's web site, "The space shuttle is the world's first reusable spacecraft, and the first spacecraft in history that can carry large satellites both to and from orbit. The shuttle launches like a rocket, maneuvers in Earth orbit like a spacecraft and lands like an airplane. 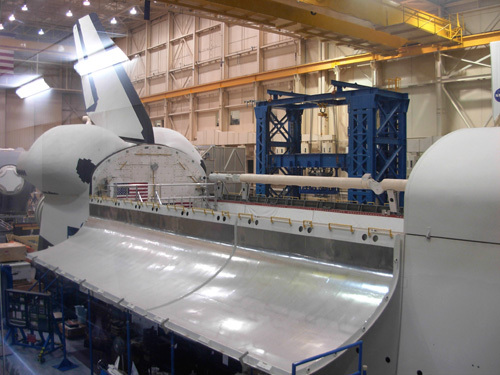 Each of the three space shuttle orbiters now in operation -- Discovery, Atlantis and Endeavour -- is designed to fly at least 100 missions. So far, altogether they have flown a combined total of slightly more than one-fourth of that." 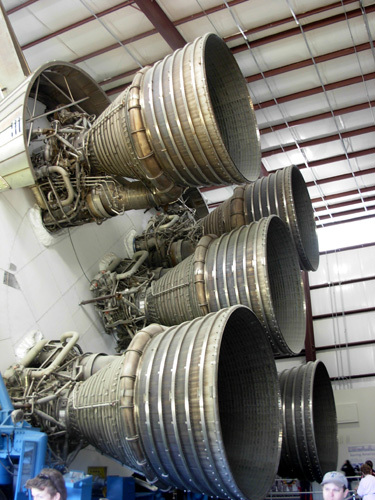 You can find all sorts of photos and interesting information about the shuttle and ISS components at the links in blue above. Use this link to see the schedule for future shuttle missions to take more components up to the space station. The third (very long) building we toured features spacecraft and exhibits from the seventeen Apollo lunar missions during the 1970s. That was quite interesting, too. On May 25, 1961, President John F. Kennedy announced the goal of sending astronauts to the moon before the end of the decade. Coming just three weeks after Mercury astronaut Alan Shepard became the first American in space, Kennedy's bold challenge set the nation on a journey unlike any before in human history. Eight years of hard work by thousands of Americans came to fruition on July 20, 1969, when Apollo 11 commander Neil Armstrong stepped out of the lunar module and took "one small step" in the Sea of Tranquility, calling it "a giant leap for mankind." 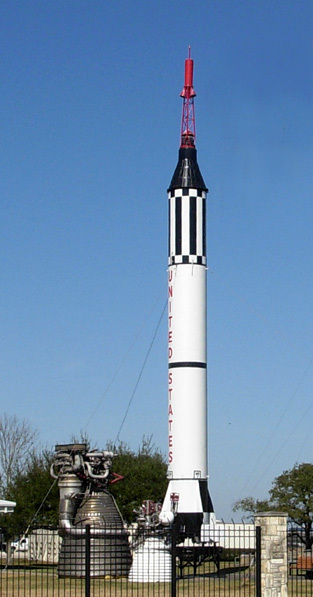 The first Apollo spacecraft was launched in 1963; the successful program ended in 1972 after seventeen moon-related missions. Seven of the Apollo flights were unmanned, ten manned. Astronauts in two of the early Apollo missions orbited the earth, then two more manned missions orbited the moon without landing. 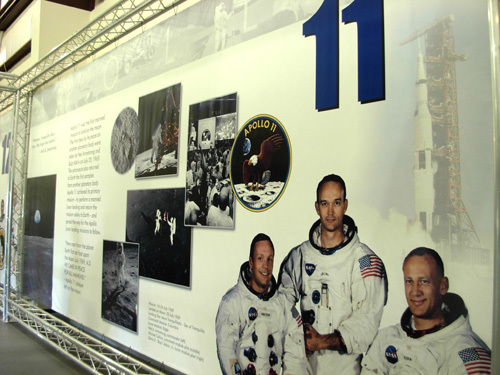 In six of the later missions (Apollo 11, 12, 14, 15, 16, and 17) astronauts safely landed on the moon and studied soil mechanics, meteoroids, seismic activity, heat flow, lunar ranging, magnetic fields, and solar wind. 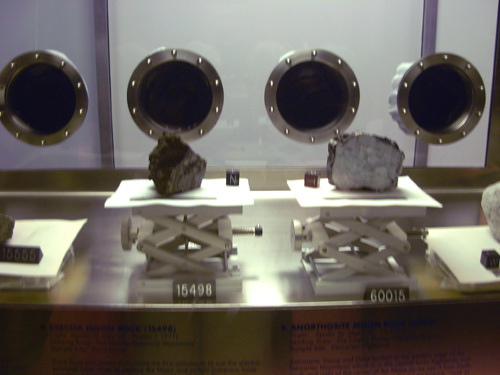 Later today we would see some of the "moon rocks" brought back to earth on those missions. In fact, we saw the whole shebang from one end to the other. 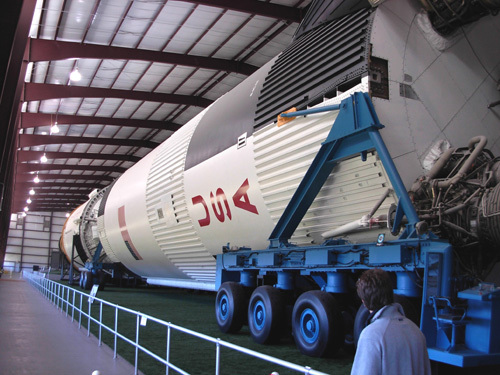 This is one of only three surviving Saturn V rockets that was used in the Apollo program. 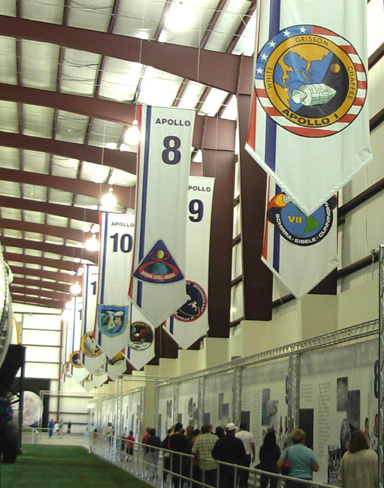 There is a tribute to each of the Apollo missions along one entire wall, with photos of the astronauts involved in each flight, a picture of the crew patch (each crew designs its own specific patch), highlights of the mission, quotes, etc. There wasn't time to read everything, unfortunately. That got everyone's attention. Exploration, progress, and adventure are not without risk. 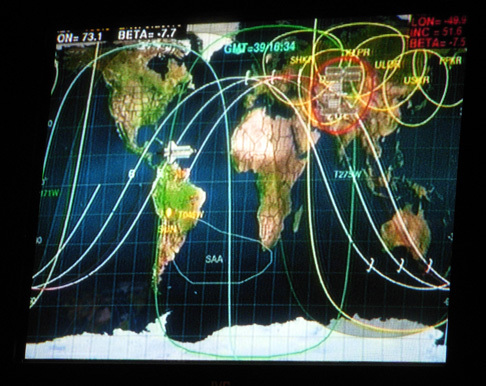 There is an interesting CBS article here about risk assessment in the space program. It was written in 2006, just before the resumption of shuttle flights after the manned flight program was shut down for 3� years following the Columbia accident. More adventurous, curious, intelligent, ambitious, hard-working, courageous men and women aspire to be astronauts -- and are willing to take this risk -- than the program can hold. Bless 'em! By now it was nearing noon and the winter morning was really warming up. We were happy to spend the next four hours inside the air conditioned visitors' center trying to cram as many activities as we could into that amount of time. (We wanted to leave early enough to avoid rush hour. Ha! It's always rush hour in metro Houston). We were getting hungry, so one of our first stops inside was the cafeteria. Although we sneaked in a couple of food bars, they don't encourage visitors to brown-bag it! The cafeteria offers six or seven different theme "restaurants" during the busy season but only two were open today. The prices were reasonable for the quality and quantity of food we got (huge Southwest chicken wraps with lots of white meat -- we should have shared one instead of getting two). 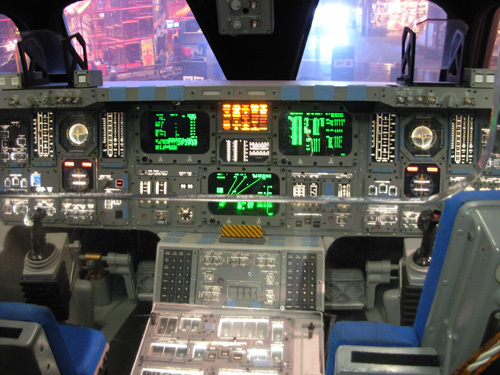 There are lots of choices of activities inside the center, from hands-on exhibits and historic artifacts to flight simulators to movies and live presentations. We viewed and participated in just about everything. 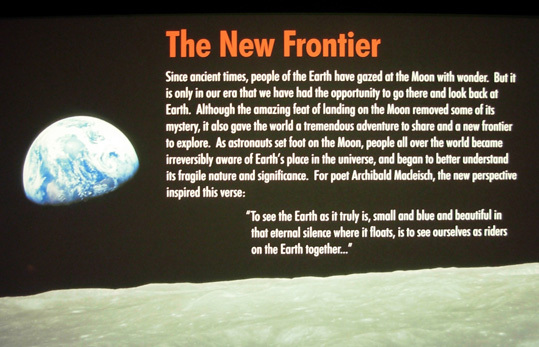 We visited the exhibits of moon rocks (photos below), lunar rovers, and trainers; real capsules from the Mercury, Gemini, and Apollo programs; replicas of Skylab and the international space station (ISS); space suits from every era of space exploration; and equipment used on board the aircraft throughout the history of our space program. 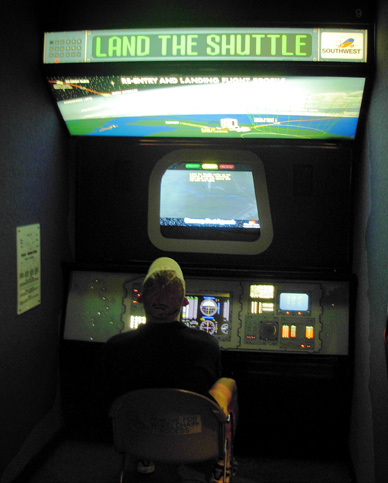 We stood in front of a wide video screen in a dark room and felt the whole room shake as the (very noisy) "shuttle" blasted off. We sat in a comfortable theatre and listened to an enthusiastic young man's presentation about the current shuttle mission (photo below). I'm glad we were there during a mission and the images were in "real time." We watched several other movies in the Destiny Theatre and on the five-story IMAX screen about the history of our space program, how the astronauts are trained, how the ISS was built, what it's like to live up there for several months, and future space program goals. The only activity we didn't do was enter the Little Kids' play space and learning center (Martian Matrix). By 4 PM we were fairly well exhausted by all this and ready to go! And we're in good physical shape, so also keep that in mind if you plan to visit. The place will wear you out. While there is ample opportunity to sit, you'll be on your feet a lot, too. If you take any children with you, expect to be even more worn out by the end of the day. Our brains were just about maxed out, too -- from all the information we'd processed and the stimulation we'd experienced. Or maybe it was from our "lift-off" in the shuttle . . .
We definitely feel like we got our money's worth (and we're pretty much tight wads!). The regular entrance fee for adults is $18.95. We got $2 off each ticket and 10% off lunch with coupons in a booklet we picked up at the Galveston Island State Park campground office (coupons are available many other places, too). We almost sprang for a good offer on an annual pass to the center that we could use next winter if we return to the Huntsville or Galveston Island state parks, but we decided that was premature. It's a great deal for locals, though. 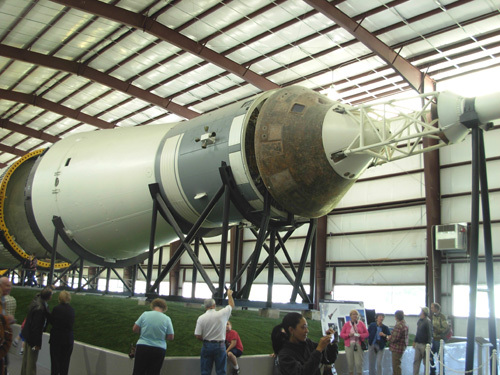 As proud of our country and fascinated with our space program as I am, I can't help but wonder how excited children and teenagers would be to visit both Space Center Houston and the Johnson Space Center. I think many would dream of becoming an astronaut, scientist, or engineer after seeing all the opportunities spread before them here. Heck, even this 58-year-old woman dreams about being rich enough to buy a tourist ticket into space (since they say I'm too old to become an astronaut). Now there's an ultra-distance adventure!! 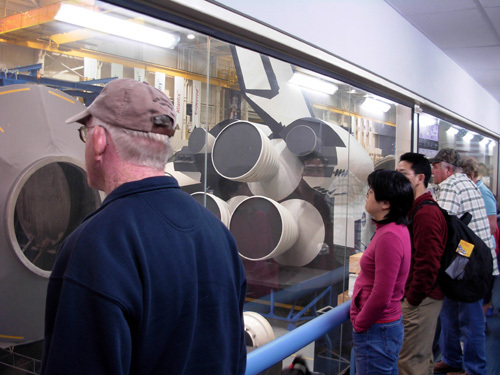 You can find a shuttle-load of information about the past and future of our space program at these two NASA sites. Have fun reading and dreaming about the moon, Mars, and 'way beyond. We discovered during one of the presentations at NASA that most everyone on earth can watch the International Space Station fly overhead as it circles the earth. Who knew there is a web page with the very precise sighting schedule for a gazillion cities around the globe?? I guess we haven't been paying enough attention the last few years! After dark on a clear night, when the trajectory is right for your longitude and latitude, the ISS is quite visible to the naked eye. It's orbiting at an altitude of "only" about 220 miles above the earth and completes each circle in 92 minutes. You'd be amazed how fast it streaks across the sky, so be outside in an appropriate place (without a lot of surrounding light or trees, etc.) a few minutes before it's supposed to appear. It's very cool to watch, similar to a shooting star. We got home while the space shuttle was still up there, and could see it, too! This spring has been rainy enough in our area, however, that about a third of the time we go out to see it, it's hidden by clouds. Here's the URL for the space station sighting schedule: http://spaceflight1.nasa.gov/home/index.html. That's a general NASA home page. Click on "Realtime Data" in the menu bar across the top, then "Sighting Opportunities." In the left column, choose your country, then state and closest city or town (if you're in the U.S.). You'll get a list of dates and times for your area for the next couple of weeks, including the approaching/departing directions, degrees above the horizon, maximum degrees on that pass, and the length of time you may be able to see the ISS. The higher the space station above the horizon, the longer you can track it visually. Here's an example for our area in Virginia. The May 21 and May 22 evening times would be great for us because we're awake, it's dark, and the durations are five minutes. That's because the maximum elevations are higher those nights. When the ISS stays closer to the horizon in your location, it doesn't appear for as long and it's easier to miss. The ISS is moving fast and it's big enough that you should see it on a clear night if you're looking in the right direction, aren't near a lot of artificial light, and have a fairly unobstructed view. Even with all the trees around our house, we've had good visibility from our second-story deck. When the shuttle is also orbiting the earth, there will be a schedule for it, too (when it's not docked at the space station).